This data set provides field measurements of diameter, tree height, and crown dimensions for 1,513 trees in 30 plots at the La Selva Biological Station in Costa Rica. 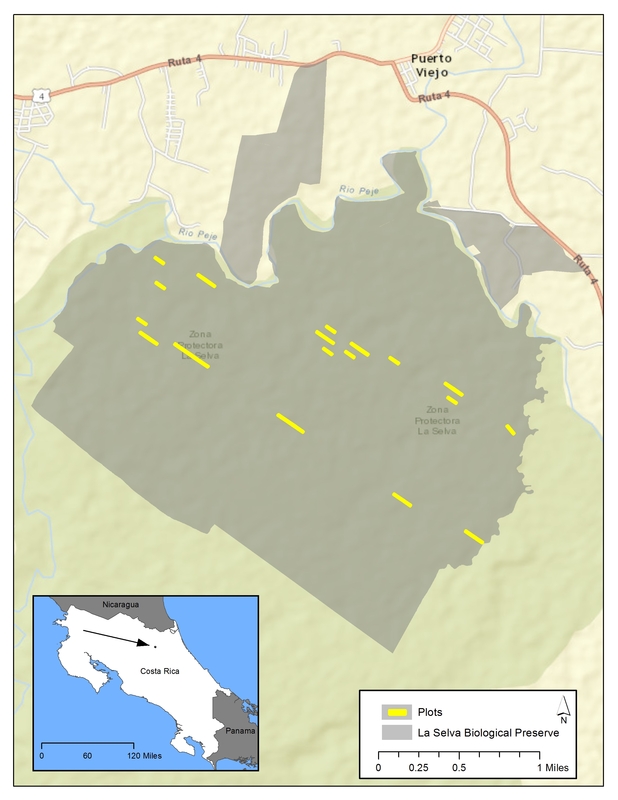 Fourteen of these plots were in undisturbed primary forest, six were in primary forest which had been selectively logged, seven were secondary forests, and three were abandoned pastures reverting to forest. The diameter and height data were used to calculate aboveground biomass for each of the 30 plots. The crown measurements were used to estimate a vertical profile for each plot, showing the vegetation volume in 1-meter increments from the ground to the top of the canopy. There are three comma-delimited data files and two shapefiles with this data set. The files contain the measurements and calculated biomass for the individual stems as well as the summary data at the plot level. Figure 1. La Selva, Costa Rica sampling locations (sampling locations from the plots.zip shapefile). All 30 locations are included within the yellow areas. The estimation of biomass in tropical forests is important because they contain approximately half of the Earth's forested biomass, and their characterization with remote sensing is difficult due to their density and structural complexity. Measurements of standing biomass can be compared over different epochs to determine biomass change and infer rates of atmospheric carbon gain or loss due to land management, disturbance, and regrowth. One approach to improve our ability to use remote sensing and other technologies to accurately estimate forest biomass at spatial scales greater than those feasible by traditional field measurements has been to coordinate campaigns of simultaneous measurements at a single site. La Selva Biological Station in Costa Rica is an ideal site for this type of study as it is a well characterized forest with decades of tree inventory and diameter increment data available and also has a well-established geographic reference grid allowing accurate locations for each stem to be recorded. Field measurements were made of diameter, tree height, and crown dimensions for 1,513 trees in 30 plots at La Selva. The plots were mainly in old-growth forest, some in old-growth forest which had been selectively logged. Additional plots were in secondary forest of varying ages. Aboveground biomass for each of the 30 plots was calculated from diameter and height data. The crown measurements were used to estimate a vertical profile for each plot, showing the vegetation volume in 1 meter increments from the ground to the top of the canopy. These ground data can and have been used to calibrate and validate remote sensing measurements (e.g. LiDAR and InSAR) taken over the same plots. The investigators were Dr Robert Treuhaft and Dr Fabio Goncalves. There are three comma-delimited data files (.csv) and two shapefiles with this data set. The .csv files contain the measurements and calculated biomass for the individual stems. The shapefiles provide summary data at the plot level. The data set covers the period 2006/02/11 to 2006/02/23. Field measurements of (1) tree stem diameter, total height, height to the crown base, crown dimensions, (2) calculations of biomass at the plot level, and (3) calculated vegetation density profiles from ground level to the top of the canopy for each plot, are presented in three comma-delimited data files. In addition, two shapefiles are included (each a set of multiple auxiliary files with the same name and different file extensions. These files provide the location of each stem (trees.shp) and the sampling transect plots (plots.shp). 8 AGBM Mg/ha Aboveground biomass reported in Megagrams per hectare and calculated using the allometric equation and wood density reported by Chave et al. biomass: Aboveground biomass reported in Megagrams per hectare and calculated using the allometric equation and wood density reported by Chave et al. File #5: tree_data.zip: A shapefile, which when unzipped, contains four files (*.shx, *.dbf, *.prj, and *.shp). Field measurements of forest structure and biomass can be used to calibrate and validate measurements derived from less labor intensive remote sensing techniques such as LiDAR or InSAR. The data can also be used as a baseline for future inventories to assess rates of biomass change in this forest. Tree heights were visually estimated and calibrated by clinometer measurements. They were determined to be accurate to 1 m, as described by Goncalves and Santos (2008). The assumption of uniform vegetation distribution within the crown is a potential source of error for the profile volume calculations. Alternate models of foliage distribution within crowns and the differences in results depending on the model used are discussed in Treuhaft et al. (2009). La Selva is a tropical wet forest (Holdridge, 1947), characterized by a high diversity of trees, lianas, and epiphytes (McDade et al., 1994). It is comprised of about 55% primary forest. It gets about 4 m/year of rainfall. For this study, field measurements were made along thirty 10 by 100-m transects (plots). Fourteen of these plots were in undisturbed primary forest, six were in primary forest which had been selectively logged, seven were secondary forests, and three were abandoned pastures reverting to forest. Field measurements included the location of each tree in along- and cross-transect coordinates, diameter at breast height, height to the base of the crown, total height, and lateral dimensions of the crown of each tree. All tree heights were estimated visually. For each tree with diameter at breast height greater than 10 cm (greater than 5 cm for the recently abandoned pasture plots), heights were measured by sighting along the arm to subtend angles from the bottom to the top of the tree. Vantage points were sought which optimized the visibility of the tops of trees. These visual height estimates were calibrated by clinometer measurements (Goncalves and Santos, 2008). where rho (in g per cm^3) is the wood density, assumed to have a linear dependence with diameter class, (Chave et al. 2004). Because species identification was not done, a mean value for density of 0.602 g per c^3, from a broad set of measurements of wet tropical forests in Central America (Chave et al., 2006), was associated with the average D measured at La Selva of 22.4 cm. The biomass was calculated by adding the mass of all trees measured in a transect (plot), and dividing by the area of the transect (plot) for field measurements, 10 by 100 m, or 0.1 ha. Lateral dimensions of the crowns were estimated by stretching measuring tape between points directly beneath the extrema of the observed crown, in the directions parallel and perpendicular to the transect. From these measurements, the lateral axes of each tree modeled as an ellipsoid were calculated (Nelson, 1997). The volume of each ellipsoid overlapping an altitude bin was assumed to be uniformly filled with leaf area and summed to calculate the leaf area volume for a series of height bins of 1 meter thickness which extended from the ground to maximum canopy height. The assumption of uniformly filled volume may contribute some error to the calculations and an assessment of multiple possible distribution models is discussed in Treuhaft et al. (2009). Chave, J., R. Condit, S. Aguilar, A. Hernandez, S. Lao, and R. Perez (2004). Error propagation and scaling for tropical forest biomass estimates, Philos. Trans. R. Soc. B, 359, 409. Chave, J., et al. (2005). Tree allometry and improved estimation of carbon stocks and balance in tropical forests, Oecologia, 145, 87. Chave, J., H. C. Muller-Landau, T. R. Baker, T. A. Easdale, H. T. Steege, and C. O. Webb (2006). Regional and phylogenetic variation of wood density across 2456 neotropical tree species, Ecol. Appl., 16(6), 2356. Goncalves, F. G., and J. R. dos Santos (2008). Composicao Floristica e estrutura de uma unidade de manejo florestal sustentavel na Floresta Nacional do Tapajos, Para, Acta Amazonica, 38(2), 229. Holdridge, L. R. (1947). Determination of world plant formations from simple climatic data, Science, 105, 367. McDade, L. A., K. S. Bawa, H. A. Hespenheide, and G. S. Hartshorn (Eds.) (1994). La Selva: Ecology and Natural History of a Neotropical Rain Forest, Univ. of Chicago Press, Chicago, Ill.
Nelson, R. (1997). Modeling forest canopy heights: The effects of canopy shape, Remote Sens. Environ., 60, 327. Treuhaft, R.N., Chapman, B.D., Dos Santos, J.R., Goncalves, F.G., Dutra, L. V., Graca, P.M.L. a., Drake, J.B. (2009). Vegetation profiles in tropical forests from multibaseline interferometric synthetic aperture radar, field, and lidar measurements. Journal of Geophysical Research 114, D23110. Treuhaft, R.N., Goncalves, F.G., Drake, J.B., Chapman, B.D., Dos Santos, J.R., Dutra, L. V., Graca, P.M.L. a., Purcell, G.H. (2010). Biomass estimation in a tropical wet forest using Fourier transforms of profiles from lidar or interferometric SAR. Geophysical Research Letters 37, L23403. Van Zyl, J. J., A. Chu, S. Hensley, Y. Lou, and Y. Kim (1997). The AIRSAR/TOPSAR integrated multifrequency polarimetric and interferometric SAR processor, Conf. Publ. 449, p. 100, Inst. of Eletr. Eng., New York.